Our intellectual heritage after each training received is one of the factors that most impact on professional and personal success, and for this it is important that the time dedicated to learning is invested by adopting effective approaches and simple techniques that optimize the amount of knowledge actually acquired. . 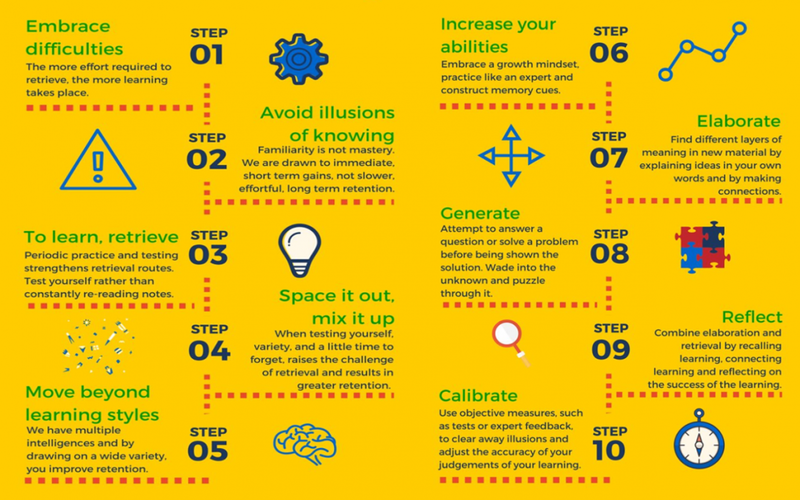 The more deeply you know a topic, the greater the capacity for creativity to apply it when tackling new professional challenges, and it is a challenge for cognitive science to identify the strategies that lead to this successful learning. 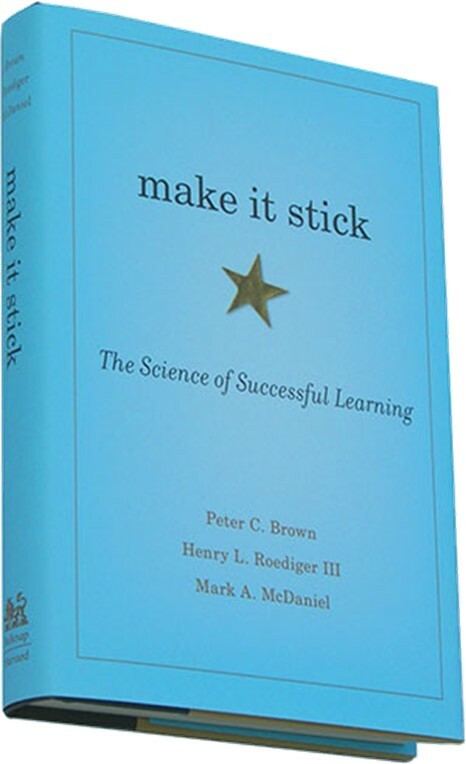 During the interview with Raúl Hernández for the Skillopment podcast, he commented that the scientific basis of neurodidactic learning that I explained that dynamizes our videogame Trainapp, was very aligned with the book “Make it Stick, The Science of Successful Learning” published by Harvard University Press, which Raul had recently read. I took note of the appointment, and discovered that this book is an interesting and very well-documented compendium of empirical evidence that supports how to enhance real learning in the human brain, documented in more than 40 years of scientific studies by the best cognitive psychologists to clarify what really works and propose strategies that achieve better results. microlearning: to avoid overlearning more new concepts than those that can be retained in a single day or session, and to help the learning program to adapt to the lifestyle of each person, just using a few minutes every time. gamification: to generate more emotion and engagement towards the acquisition of knowledge, giving the best of itself to improve its position in the ranking of the game goals execution. Codification: Translate stimulus to provide them coherence with previous knowledge and enable to store them. The more concentration, depth of analysis, attention and motivation has the person, the better it will be codified in the long-term memory and not only in the immediate one. Consolidation o storage: Save the information in an orderly and categorized way so that it is stable in the long term. If the information already finds similar concepts memorized, or if it is reviewed, its consolidation is favored so that it is not forgotten. The transition from learning from short-term memory to long-term storage requires a period of time. Recall: Ability to process, find and use a concept from memory in each professional opportunity to make successful decisions. It is only possible when the previous steps have been carried out correctly. Fluency versus Mastery: Do not experience the illusion that something is already known just for having finished a course, as it may not be so. When we try to learn a formative content simply by reading texts in bulk one or several times emphasizing it, we will get to become familiar with it in a fluid way, and we can falsely have the illusion that we already master it, but it is not like that. Expect to brood before the exam: What is acquired quickly goes quickly, and therefore with marathon study sessions as binge-eating knowledge, not a long-term reminder. Dedicate time to uniform blocks: if you only practice one type of exercise in a massive way until you master it well, you will only learn that skill. If instead you alternate different learning, you will learn more completely. The most used strategies by university students are to reread texts, underline them or summarize them taking notes.It has been shown that these strategies only manage to familiarize them with the concepts, but they do not lead to their mastery or reminder. Rereading, for example, after a previous reading, is a slow method, and does not generate lasting memory. As familiarity and fluency in the reading of a text grow, the false illusion that the content is mastered emerges. Knowing how to repeat the sentences of the notes taken in a class or a text, does not allow to dominate the ideas either. To really learn, you have to go beyond the texts. Make sure you understand the meaning of the precepts described, their application or how they relate to what is known. Paying attention, they can know it at the end of the class, but can they apply it to their work? Only productive training enables and preserves the concepts in our memory. In this way, it facilitates that we can recover those skills or knowledge to solve future unexpected work challenges and take advantage of opportunities. How could we to master anything? 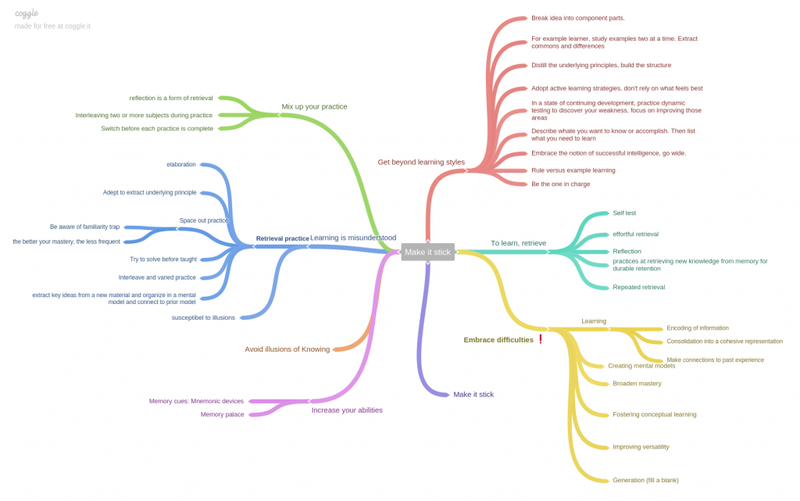 The following strategies contribute to people achieving the mastery desired by the trainer. Mainly, they consist in persecuting the brain to work more in processing the concepts adding difficulties. When learning seems slow and demanding, it is when real and effective learning develops. This forces the students to process the information in a more demanding way from the cognitive point of view. To train by achieving long-term mastery, the trainer must focus on learning and giving opportunities to practice. Due to the neuroplasticity, the practice will change the neural networks of the brain and the intellectual capacities, improving the performance. It consists of using questionnaires to test our real knowledge in an objective and productive way, identifying our areas of weakness in which to pay more attention or what we already have consolidated, and at the same time to make the exercise of trying to remember the concepts of the agenda. It is very good, for example, for the student to self-evaluate with a low-risk test for their final grades, responding reflexively and without stress to multiple-choice questions (“Test effect“) in which to apply the acquired knowledge. Trying to answer correctly a question or a problem that is difficult for us, forces us to reflect exercising multiple cognitive functions. Consequently, it generates better learning, even when the answer is incorrect. The more “mental sweat” it costs us to recover some of the memory, the better it will be anchored later and the more it will also cost to forget it. As with Heisenberg’s uncertainty principle in physics, where measuring the property of a particle reduces the accuracy with which another property would be measured, exams do not actually measure the level of knowledge, but directly increase and deepen it during its realization The simple fact of including a test after a class or talk produces a great improvement in the final notes. Its benefits continue to increase as the frequency of the tests increases throughout the training project. To solidify learning it is useful to make mistakes. The trial-error effort leads to a complex domain and a greater knowledge of the interrelationships between things. A deferred correction, a time after completing a series of questions, makes learning to stay better. We must be aware that we can only actively recover what is well stored in memory after being effectively learned. In view of the fact that dynamic tests are one of the most powerful tools available to the trainer, so that they are not perceived as exams, they can be incorporated into training programs in a gamified form, involving students in question sets (such as Kahoot or Trainapp), or even better if they themselves create flash-cards or elaborate quiz questions for their peers in the context of the same game. It has been proven that the same teaching hours achieve more retention if they are distributed over time, instead of concentrating in a few days or hours, saturating the daily capacity of retention of new learning. The reviews recovering the memorized knowledge are more effective allowing a time to rest between the learning sessions. Time increases the difficulty and, therefore, the cognitive effort to remember them. This additional effort attenuates the slope of the forgetting curve and enriches its storage with the nuances of the environment. Thus, we strengthen the neural network that facilitates its practical application. The more you have forgotten a topic, the more effective the relearning in the configuration of your stored as permanent knowledge. Forgetting takes time, but it is an ally to relearn more effectively the next time you learn the concept. The periodic spaced practice thus stops the indefinite forgetting, strengthens the recovery routes and is essential to consolidate knowledge. People have different types of intelligence to influence learning. The more variants we stimulate by presenting the contents in different formats and resources, the synergies between them will get us to learn more. Dual coding, for example, consists of our memory registering text stimuli together with visual images. The trainer can propose an integral training program considering several formats. For example, a face-to-face introduction to the topic, followed by a debate to resolve doubts and concerns. You can end up with an online consolidation with perhaps questions that contain visual images, mix topics and be reviewed periodically. Even if it is more difficult, it has been seen that it is more productive to alternate the learning of several intertwined themes, or different aspects of the same subject, than to repeatedly insist more and more time on it. Theme changes activate our attention and enrich understanding by interconnecting concepts. In textbooks, each chapter is followed linearly by a set of problems to practice on that subject. Then, it is passed to the next chapter getting an immediate but transient fluidity. This makes it easy to know how to approach the problem even before reading your statement. After a time without addressing a topic, the brain will have to work harder to recover it, and it is precisely this desirable effort that will generate more reminder than if we learn by dedicating time to a single topic without moving on to another until the next learning session. If you practice again and again quickly, you are leaning on the fluidity that short-term memory generates. The need for little mental effort observes an instantaneous improvement, but insufficiently solid to sustain itself. But with mixed practice, spacing and interspersing concepts, the brain unconsciously recognizes deeper patterns and streamlines the easy retrieval process of memories in the future. It has been proven that the ability to become an expert in extracting the underlying principles or “rules” that differentiate the types of problems, to relate them to other things that we already know and to be able to make the best decisions in future unknown situations, is better acquired through interspersed and varied practice than with concentrated practice. Changing the location where the person is exposed to the same content, gets a deeper impression in the memorization. This is so because when expanding the associations, a greater neuronal anchoring is generated that enriches the recovered one. Writing with own words the topics to learn, generates more impact than passively reviewing what has been previously heard or read. It is useful, for example, to write a summary of what you remember that you have learned at the end of a training session. Thus, you build structures by extracting the most important ideas and create a coherent mental framework from them. This summary can be done for yourself or another person to help you understand it. For this, it will be necessary to have sufficiently worked the content previously to master it, connecting the new concepts with the previous ones. Only when you are able to explain something in a simple way does it mean that they have processed it in depth and assimilated correctly. The more you mentally process the new learning to relate it to previous knowledge, the stronger your understanding will be. In addition, it will create more neural connections, helping to remember it later. If you are not convinced that you can master a certain topic, you will not put enough effort into learning it well and mastering it. It is necessary to visualize a reason why it is worthwhile to master a theme to achieve the winning mentality that leads to achieve it. People whose performance unconsciously limit their potential. If you focus on validating a skill, you will choose challenges that you trust to fulfill to show you competent again and again. But if your goal is to increase your capacity, you choose bigger and bigger challenges. You must interpret failures as useful information that helps you sharpen your focus, be more creative and work hard. The infographic of the initial image has been adapted from David Vaillancourt (@drvcourt) twit on April 2, 2016, shortly after the book “Make it Stick” was published in the United States. For more than 2 years, at Siltom Institute we worked passionately to solve the need to achieve efficient learning. To achieve this, we set out to make the most of the scientific findings in decades of cognitive studies. We identify the most efficient learning strategies, which allow to align the teaching with the functioning of the human brain. Thanks to current technology, trainers are more easily able to implement these strategies. The result has been the creation of Trainapp, an application that takes the lead of the gamified Learning Retention System (LRS). It is the most complete application in training effectiveness strategies and with the best user experience. Trainapp guarantees the consolidation of the training provided, ensuring that it is not forgotten with the passage of time. It empowers people so that they can apply the training with agility before every professional opportunity. 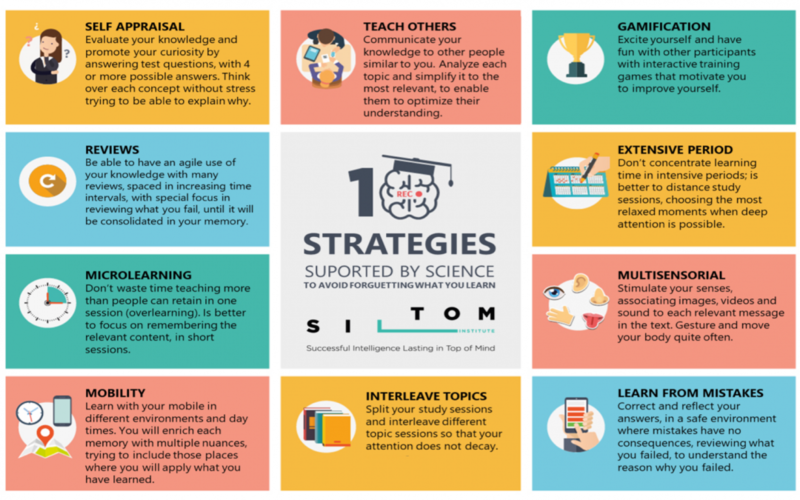 In the first months we identified the 10 most robust strategies according to the conclusions of scientific studies that showed neurodynamic value to remember long-term learning, and enhance its practical transfer. The union of all these functionalities gave rise to a very differentiated training methodology, which we call SILTOM. This name comes from the initials of Successful Intelligence Lasting in Top of Mind, which gives our company its name. The second phase was to innovate by devising dynamics of a serious game that would bring together such efficient strategies or study techniques that integrate the SILTOM methodology, and turn them into motivating and attractive gamification experiences for the user. The final phase consisted of developing these dynamics in the sections and functionalities of a mobile application with intuitive usability. Once developed, we validate it in formations of commercial networks of several companies, obtaining an excellent acceptance of the users. Our tool is the only one that, at present, energizes the 4 key strategies to consolidate learning. These are: the self-evaluation, the personalized reviews, the microlearning and spacing the training sessions in time. The game is integrated under the guiding thread of an itinerary with the appearance of a modular extension train track. Assemble scenarios with 50 new questions each and go through a series of stations that house the training pills. At the end of the journey, you can apply the new knowledge without the need for great concentration. On the contrary, they will flow easily in the face of professional challenges due to unconscious and immediate neuronal processes. It is possible to convert the self-assessment into a motivating experience by giving the game the interactive quiz format with 4 response options. If the difficulty of the questions is adequate and is really a challenge, the quizzes are very addictive. This is due to the emotion generated at the moment when there is a 50% chance of hitting or failing. Trainapp differs from other training games in that it has tried not to cause stress to the user. Stress is very counterproductive for the brain to generate quality memories. With Trainapp you have 99 seconds to reflect well on each answer. Proper mental processing is the key element of active training to generate a long-term reminder. We could summarize it in a typical sentence: “I think, then I learn”. Other differential factors are that the screens offer wide spaces to develop in depth the concepts or pose practical situations, after responding the user is shown an explanation that allows him to expand or contextualize the concept and understand why his answer was incorrect, and to accumulate these explanations are built a section of notes by the procedure of learning by doing (learning by doing) that allows review and obtain deferred correction identifying which were failed, to learn from the error and focus on them the attention to memorize them correctly. In Trainapp the spiraling educational itinerary is advanced, balancing the curiosity aroused by the new concepts and interspersing between them revisions of the concepts previously answered. These successive revisions are customized to the specific reinforcement needs of each user through an adaptive algorithm. Therefore, as many impacts will be generated as are necessary to certify that the concepts have been learned. The user will be able to monitor the evolution of their answers in% of successes in order to achieve excellence. By the end of the game, you can demonstrate that you master more than 95% of the concepts. This challenge is a powerful intrinsic motivating factor when evidencing the effectiveness of the time spent learning with Trainapp. Trainapp is considered a gamified platform of microlearning, whose objective is to increase the retention of concepts by dedicating the minimum possible time. The objective is to avoid receiving more knowledge that has the capacity to retain in the same day. The strategic agendas difficult to digest in intensive courses, are divided into small “nuggets” of formative micropills. They can “peck” voluntarily by receiving brief sessions anytime, anywhere. To adjust to the time of deep attention of the human brain, the game has an energy that limits the total time of reflection of the answers. This time does not exceed 15 minutes. This time is significantly reduced before each failure so that, in each session, there have been few errors. In this way, you can focus your attention on learning them well. Each concept is accompanied by images or videos that build a multisensory experience of visual messages enhancing its reminder. With the same objective the concepts are presented interspersing different thematic categories, in order to maintain the attention always as high as possible. Since it is shown that the same hours of study or study are more productive distancing them in time, with Trainapp this effect is achieved with a modular route of series of stations, where getting to move from one to another is an exciting and addictive challenge, and that a certain volume of hits must be accumulated while energy is available, and each failure remains. The stations can remain inactive until the trainer accesses them to the users. With this, it avoids that users with better starting level can advance faster. Trainapp arouses undoubted interest so that corporate training can impact the company’s business results and generate ROI, an objective that with traditional training only reach 8% of companies according to the 2017 Workplace Learning Report. Another interesting application of Trainapp is, for marketing managers, training to distributors or prescribers of their products. With inspiring microsessions several times a week, they gain assurance in the argumentation and characteristics of their sponsoring brands. Given that Trainapp keeps users active in the project for several weeks or months, the prescriber receives multiple impacts (15-20 days for each scenario of 50 questions) of their arguments or branding, conquering their top of mind and generating an increase in your sales. 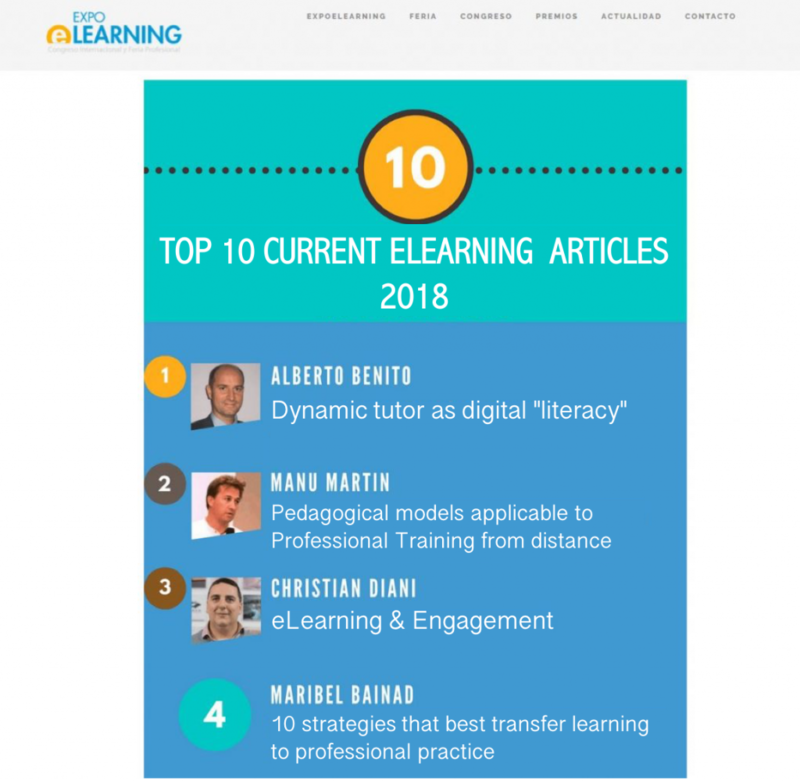 We want to congratulate AEFOL for its excellent initiative to launch the collaborative blog eLearning Actual, which from the hand of multiple authors will be addressing the different aspects that affect e-learning. Aefol is defined as a company focused on disseminating the most efficient tools and technologies available to companies, or the most successful projects of its professionals, as well as constituting an excellent meeting point for networking among professionals of the information at its congresses and events. The launch of the collaborative blog project took place as a prelude to the 17th edition of the ExpoeLearning congress that was held in Madrid on March 1 and 2, 2018, and had more than 4,500 visitors. Those who enter, you will see that the organizers produce a video-summary presenting each article, as an index of the contents. This year readers were able to vote which they considered to have been the best eLearning writer among the posts presented. For very little we could not reach the podium, and the post of Siltom Institute was in the 4th place, so we live the effects of motivation that appear when incorporating the gamification to our habitual role of neurodidactic disseminators, competing with the rest of the columnists. And without a doubt, the best prize was the opportunity they gave us to publicize the most effective strategies so that learning is not easily forgotten with the passage of time, which is the workhorse on which we always ride with passion. We take this post to congratulate the winners who could reach the podium. Congratulate, also, the creators of the blog eLearning Actual for this project. We are sure that it will continue to bring a lot of value to corporate trainers. 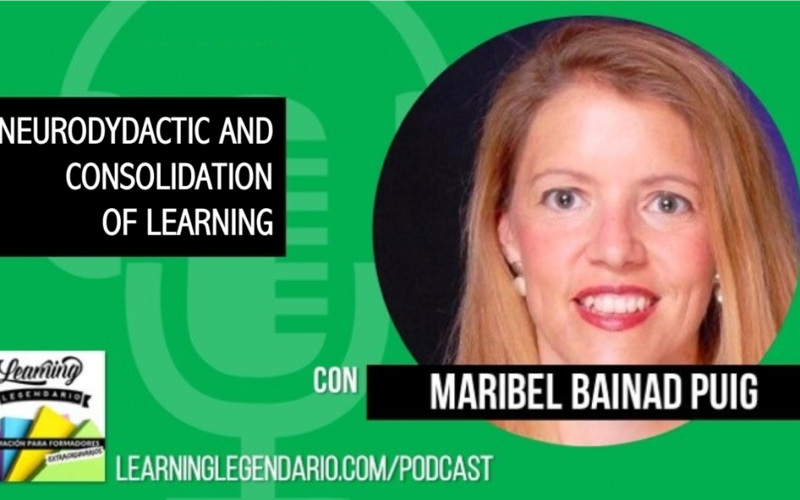 Last week Juan Daniel Sobrado interviewed me on a blog podcast Learning Legendario, which aims to teach trainers to get impactful, participatory and memorable training, and thus combat the endless PowerPoint sessions with little or no involvement from the participants. In this context, the neurodidactic focused on consolidating the learning of 21st century professionals could not be lacking. Applying to Enzo Ferrari’s famous phrase “Everything that deserves to be done, it deserves to be done well”, we can also affirm that “ALL TRAINING THAT DESERVES TO BE GIVEN, DESERVES TO BE REMEMBERED.” With Juanda Sobrado we talked about what the trainers can do so that the courses they teach are consolidated in the memory of their students and do not start a caustic process of falling into oblivion as soon as they finish the last class or exam. Getting the knowledge to remain fresh in the memory for a long time, is the only formula so that in parallel you get to speed up your mental processing and apply it to the practical challenges of everyday life. Practically all medium and large companies offer their employees a digital campus of training content. The campus provides them with access to the training they need to be trained in their positions. The software that manages all these contents is categorized as the Learning Management System. Although Moodle was the pioneer, multiple alternatives are currently commercialized that improve its usability or extend its functionalities. With an LMS, those responsible for corporate training can design courses easily. Through a final exam they confirm that a certain profile of the staff has reviewed its contents. In most cases, this test is performed immediately after the employee has read the course. Its function is to certify the reading of each module and assess the degree of understanding of the concepts immediately above. To overcome this test, the employee should only resort to his short-term memory to give a good impression in the photo-finish recorded by the LMS. This is usually monitored by the Human Resources Department or by technical professionals who have created the contents. But … why leave the campus courses obsolete once they are finished? How many employees re-enter voluntarily to review periodically in order to keep all that interesting knowledge acquired fresh? To those who have access to the LMS of your company, I invite you to answer the previous question. Check the interesting data of how many revisits a course has once passed the final test. Most courses are only reused for onboarding processes of new employees, or for changes of internal position. Repeating a course is tedious. People will only re-read the contents when they are presented with a problematic situation or unresolved question. 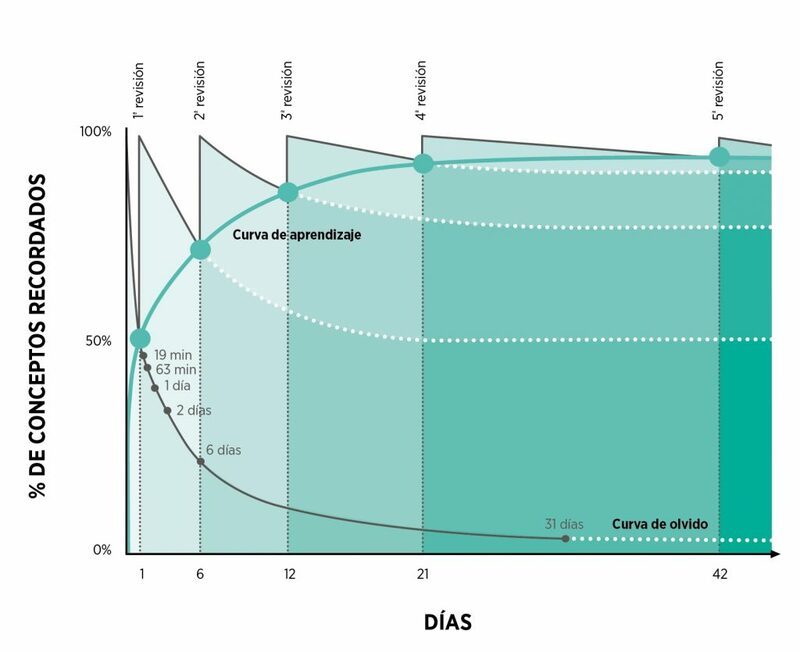 Recent studies describe that creating each hour of a course has required a dedication of the trainer of between 1 and 3 weeks of work (between 42 and 143h); therefore it makes a lot of sense to pretend that all this effort is used to the maximum. The human brain in a couple of days after the course will retain less than 40% of the concepts and, a month later, less than 10%. To maximize the likelihood that the content provided by the LMS can be applied successfully to each professional challenge, the company needs to establish a strategy for people to consolidate in their memory the greatest possible volume of knowledge taught in the courses, or at least the most strategic. This rapid replacement of what is learned by the memory is independently that the final test has been passed with high marks, although it can be very influenced by the experiential format of the course (passive or active). If the concepts learned are applied frequently or are reviewed from time to time, they may be transferred to professional actions or decisions. If these revisions become consolidated, they will be applied with agility. The brain can resort to them operating from their subconscious neural circuits, which are practically instantaneous to ensure our survival in the middle. The software categorized as Learning Retention System (LRS) serves to consolidate knowledge in people’s long-term memory. As in the advertisements, if they do not expose you to multiple impacts, they will not change your buying attitude. The training impacts can not achieve a change of knowledge or skills if it is not with the re-impacts of the LRS. In terms of DIGITAL TRANSFORMATION, if the LMS facilitates digital access to the training content, the LRS what it digitizes is to certify that there has been a memorization of effective learning applying the best study techniques. 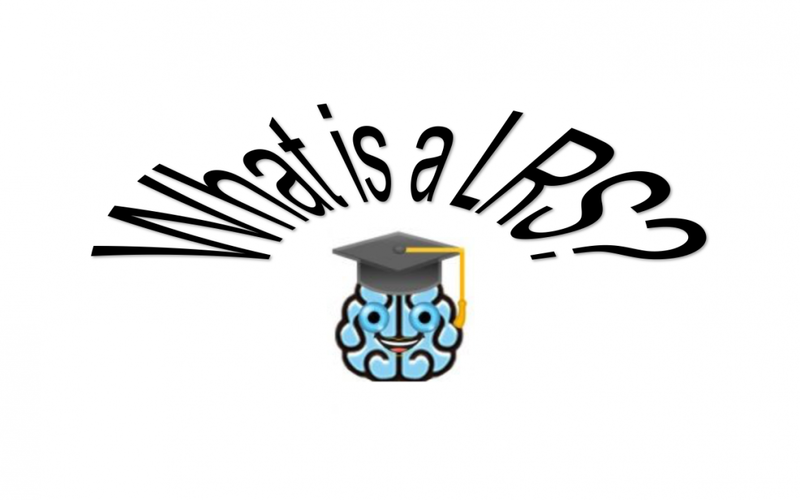 How does an LRS consolidate the knowledge? sending weekly 1 or 2 training pills reviewing a paragraph of the course taken, attaching images that illustrate your visual message. This format can be done by the trainers without acquiring specific software. Lacking interactivity, it does not force the employee to make decisions and therefore his reminder is less effective. The TrainApp game has been specially designed to consolidate knowledge, since it includes neurodynamic dynamics based on the conclusions of multiple studies, and in a playful and motivating way it incorporates the most effective study techniques among other long-term reminder strategies. The driving thread of the game is the journey of a train that runs modules of 6 stations. These stations are similar to formative micropills of 10 new concepts, which integrate a spiral training itinerary. This combines the curiosity that awakens the new with revisions of the previous concepts. The questions of the game are repeated at increasing intervals, customizing the ones that need to be reviewed by each player until they are consolidated. It also differs by its functionality. 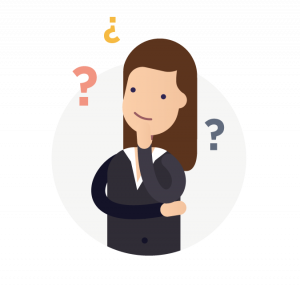 It gives the opportunity to the users themselves to share their know-how, creating questions for their colleagues to answer. There are consultants such as Domoscio that can integrate their algorithms into the corporate LMS, a system for planning spaced repetitions of the content modules of the courses. The successful Duolingo application makes it easier to learn languages through the “programmed obsolescence” of the student’s passage through its modules. At a certain date, the user is recommended to repeat them again. The traditional format of continuing education through courses is so widespread and ingrained that it seems unnecessary to question it. It would be expected that, in case of not working, the simple “natural selection” for centuries would have corrected or extinguished them. I will not be the one to say that the courses do not work, but the more things are about the processes by which the human brain learns better, the more I realize that the way they have always considered involves a series of “traps”, that can significantly reduce the effectiveness with which the student learns, since they lead learning to fall into oblivion. 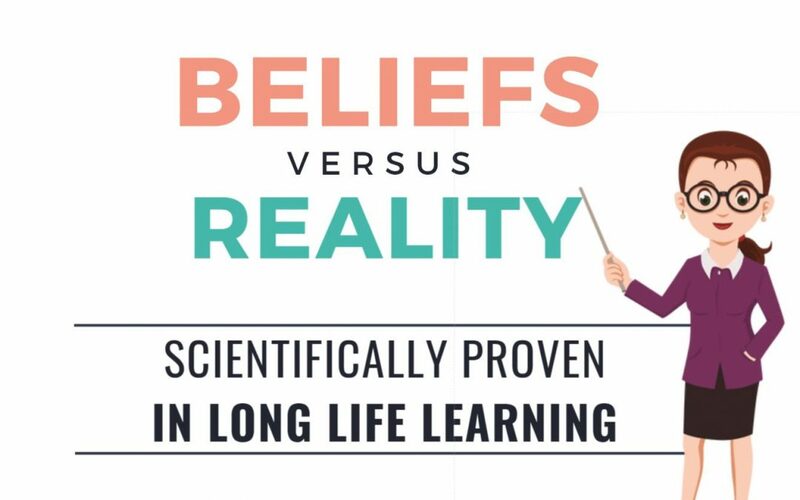 Belief #1: The courses train people so that when they finish they can successfully solve situations that can be presented at any time. When the course ends, the concepts learned run the risk of not being consulted in the student’s memory. They may forget completely if they do not use them frequently or review them periodically. Just as in advertising a single impact of an advertisement is not enough to modify the behavior of a consumer, neither is a single training impact. When designing a training process, the course format is interesting so that the person receives extensive information. For this, the initial phase of the training should be considered, since then the learning must be continued. It can be done through periodic reviews of the contents, until they are consolidated in the memory. The person must be able to apply them with agility from their subconscious cognitive activity. A few months ago I did a course on accounting for entrepreneurs (8h divided into 2 mornings). On Thursday the teacher decided very aptly to start the class by asking the 25 participants to list the topics we learned on Tuesday of the same week. My great astonishment was that, however much the teacher explained it to us in a pleasant and understandable way, and that we all enrolled in the course voluntarily with a real motivation to know better the accounting concepts, at that time we were not even able to remember from that we talked about 48h before. Fortunately, the professor broke the uncomfortable general silence by remembering what he explained, and of course, then we remember him and we recovered the memory from this hook. But at the end of the course the teacher moved away from our lives, and without having in hand the fabulous photocopies of notes that he gave us, we can not possibly expect any of us to interpret a balance of the way we did in the interesting exercises facts in class. That a professor more or less does not influence the speed with which we will forget the concepts he teaches us. More important than the depth of the teacher’s knowledge, that is capable of transmitting in a motivating way, that generates in his students as to generate desire to reflect and deepen the subject on their own. The great experts are very useful to teach other experts less, or to direct applied research work, but to train people, skills and mastery of training methodologies are the critical factor for the students of a course to really learn or do not. The master class format has proved ineffective in multiple studies. People are only able to keep brief minutes at full capacity to listen to a talk passively. Both children and adults feel better when something is taught by a peer of the same level (peer-to-peer learning) than when someone who is farther away explains it. This companion will transmit it with a flatter vocabulary, with closer examples and with a confidence that allows us to improve the understanding of what we are doing before reaching the audience. More and more companies opt for learning communities and forums so that their social networks or their customer service call teams share their knowledge and contribute to the collective intelligence of the company. Today we know that to achieve a faster, easier and more durable learning, not only must we use the head, but the gesticulation with movements of the whole body will have a remarkable synergic effect. An experiential training that allows us to move our arms or walk through the classroom, will improve comprehension and performance, and not only because it will prevent the kind of sleep, but because everything that improves our interaction with the outside world increases the ability to understand and remember that learning. The more important a message is, the more the teacher gestures when emphasizing it to transmit it, and the more it captures the attention of the classroom. The concepts will be stored in the memory of the students linked to these gestures and therefore with a greater number of neural connections that facilitate their subsequent reminder regarding if they had only expressed words. Science is not yet able to describe in detail how moving the body stimulates mental work, but we know that exercise releases neurotransmitters in the brain that proliferate brain cells and increase connections between neurons. We have all proven that it is good for us to get up in each coffee-break to recover the ability to attend the conference presentations. It is also known that people who play sports have more capacity for concentration and even greater ability to learn new languages. There are studies that have proven that the e-learning of languages ​​listening to audio while practicing sports increases the capacity of people to memorize and retention time and is achieved by understanding and applying better the new vocabulary. In conclusion, let’s be clear that sitting for hours without moving is not the best way to learn. that is not contextualized why some answers are correct and others are not. Gamification uses games so that people are motivated to do things that can be tedious. Well-designed dynamics can make a game easier to apply the most effective study techniques, and provide an excellent methodological training base to technical people without pedagogical knowledge who need to train in excellence to commercial teams or customer service teams for example. When I worked in the pharmaceutical industry, most of the time we were the product managers who formed commercial networks. We did not have knowledge of the most basic concepts and we just went out and explained what we knew. We trusted that at home they would return to watch the presentation on their own, which almost nobody did. They were usually 3 intense days of “veneer”, and curiously there were very few doubts during the talks. Did they understand everything without raising any doubt? Possibly, most of them were in the room only physically, while their brains were elsewhere. Everything so strategic that we explained to them did not apply later in their visits to the doctors. Generally, they acted on their own initiative delivering some promotional material before leaving the office. The gamification of the training can be an ally to align the marketing departments with the sales ones. Thus, it is possible to achieve that the transmitted concepts are not only listened to but reflected by the commercial ones. In this way, greater attention is maintained during the talks and the marketing team receives feedback on what has been understood and what has not been understood. If the game is considered once the meeting is over, it will serve to consolidate well all the concepts transmitted. Users will gradually digest and incorporate their professional practice. In practical training an intensive course can make sense to train people. To generate a reminder of data or theoretical aspects, the longer the intensive course lasts, the less effective the learning will be. It has been shown that the same teaching hours are more productive the more distanced they are from each other, as they will remember more concepts and for longer. The microlearning format starts from the most strategic contents and exposed in microses of maximum 15 minutes. This format is triumphing in the professional fields. showing great effectiveness and also fits better to the rhythm of life. We remember better the message of a TED talk listening to it during a subway trip, than when we are given a long talk. When an extensive meta-analysis evaluated the ability to generate a long-term reminder of the 10 main study techniques, it was evident that the most frequently used to pass a test such as re-reading notes, underlining them or summarizing them, are short-term and their effectiveness ends once they have passed. the objective of the exam. At that time when the tension can be lowered, an external evaluation takes place. A process of forgetting what has been learned begins to make room for the next thing that will be evaluated. The exams can not be considered the goal of the training. Generally, they only guarantee that the person has read the agenda and therefore is able to overcome the final questions. If the contents are not encouraged to be revised more often in the following months, they will hardly be applied. Edgar Dale’s experiential learning pyramid shows us that the most active learning is teaching others. This is the one that Dale considers capable of generating a 90% long-term reminder. To convey good learning, the speaker should prepare the topic in depth. You should analyze the most important thing and look for good ways to communicate it so that people understand it. For this reason, no one will have learned as much from the experience of that class as the teacher. To take advantage of the reminder strategy, the head of training can divide the agenda into several sections. Also, it can make it to the people who learn to present their part to the rest of their classmates. It can be a good starting point to create an enriching learning community. Do not consider the final exam of the course as the goal of the training. At the end of the course, encourage the periodic review of the concepts, for example, by sending short training pills. In this way, they will review what they have learned in short and relevant fragments. Posing quiz games as efficient self-assessment tools that can substitute the exams, especially if they have the possibility of making periodic repetitions of the concepts until they are consolidated in memory, as Trainapp does. Encourage students’ research on aspects of the syllabus, and then share them with classmates. Ensure that the course is as experiential as possible, avoiding master classes. Seeks people to participate and move from the chair on several occasions to maintain their attention.